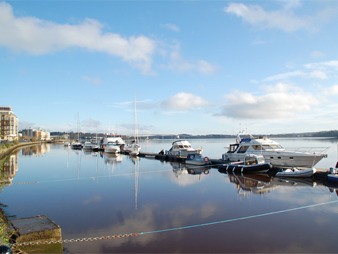 Berthing facility for marine leisure craft at Queens Quay in the centre of Derry. It is the ideal destination for sailors cruising the north west coast of Ireland and the Foyle Pontoon provides visitors with a safe and secure berth, serviced with electricity, fresh water and share power. All visiting yachts should report to Harbour Office on VHF Channel 14.